YRG CARE Infectious Diseases (ID) Laboratory located at the Voluntary Health Services (VHS) Hospital Campus, Taramani, Chennai-600113, was established in 2000 in collaboration with Johns Hopkins University, Baltimore, USA and Brown University, Rhode Island, USA with a financial grant from the National Institutes of Health (NIH), an agency of the United States Department of Health. Nobel Laureate “Dr. Françoise Barré-Sinoussi (co-discoverer of HIV)” visiting the YRG CARE Laboratory. 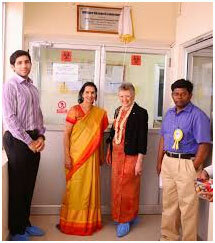 Along with her are (left to right) Dr. Sunil Solomon, Dr. Suniti Solomon, and Dr. Saravanan, of YRG CARE. This ID laboratory is staffed by experienced and qualified professionals and has good infrastructure to meet all the emerging needs of diagnosing HIV and other infectious diseases (such as sexually transmitted infections [STI], tuberculosis [TB] and viral hepatitis) with state-of-the-art equipment in its 8500 square foot facility. The laboratory’s divisions are: Serology; Microbiology & Mycobacteriology; Biochemistry; Hematology & Immunohematology; Immunology & Core Immunology; and Molecular Biology & Genotyping. The laboratory is engaged primarily in quality assured diagnostic services with the ISO 15189:2012 quality management system, conducting biomedical research in the areas of the basic sciences and offering educational programs organized by qualified scientists/faculty. Laboratory staff have attended several workshops on diagnostic and research methodology; this includes international training programmes. HIV/ART monitoring tests (CD4 count and HIV-1 viral load). Opportunistic Infections (OIs) including bacterial, fungal, parasitic and TB infections. PCR (Real Time PCR, Multiplex PCR) based molecular tests for HIV-1, HBV, HCV, TB and CT/NG. Genotyping by Sanger’s capillary gene sequencing for HIV-1, HBV and HCV. 2000: Establishment of YRG CARE ID Laboratory at VHS. 2001: Recognized by University of Madras as an affiliated research institution for PhD program (Medical Microbiology). 2003: Introduction of cost-effective CD4 count test. 2004: Introduction of HIV-1 drug resistance test (Genotyping) for patient care services. 2006: NIH (USA) recognized YRG Laboratory as an “International Regional Specialty Genotyping Laboratory (IRSGL)” for HIV-1 drug resistance test. 2008: Organized First International Science Symposium on HIV & Infectious Diseases. 2008: YRG Laboratory was accredited by NABL (Govt. of India) for ISO15189:2012. 2009: YRG Laboratory was recognized by DSIR (Govt. of India) as R&D. 2010: YRG Laboratory organized 1stInternational Workshop on GCLP. 2011: YRG Laboratory was endorsed by CAVD/CAVIMC to perform certified HIV Neutralizing Antibody (NAb) assays. 2012: NIH (USA) recognized YRG Laboratory as an “International Regional TB Diagnostic Laboratory (RTBDL)”. 2013: “Biospecimen Repository Facility” dedicated by Dr.Ramesh Paranjape (Director-NARI). 2014: “HIV Cure Research Laboratory” dedicated by Prof. Françoise Barré-Sinoussi (HIV co-discoverer & Nobel Laureate). 2015: “Polychromic Flowcytometry” dedicated by Dr. Carl Dieffenbach (Chief of Division of AIDS, NIH). 2016: Introduction of Rapid HIV-1 viral load test (results in 3 hours time) with GeneXpert IV system.